"...It’s a gripping story of sexist unfairness, all the more so since you are not likely to have heard it before, assuming you’re not a specialist in this field. Don’t be put off by all this science. It’s fascinating. And never dull for a second. If you know a young girl or woman interested in science, there is no better 90 minutes in town. Actually, that’s true for anyone." "...Vanessa Stalling's deft, thoughtful staging features a stellar Chaon Cross as the suffer-no-fools Franklin. The memory-play direct-address narrative device feels a bit clunky at times, but allows us to see how the men surrounding Franklin-from her smitten-but-condescending lab supervisor, Maurice Wilkins (Nathan Hosner), to the sexist and anti-Semitic James Watson (Alex Goodrich, in fine smirking fettle)-view her. (Mostly, they're puzzled at her utter lack of interest in catering to their needs.)" "...Chaon Cross deserves great credit for her crystalline portrayal of Franklin as a brilliant scientist who lands in a bastion of smug male superiority - Cambridge University in the early 1950s - and realizes that it's either isolate herself in work or end up making coffee for the guys." 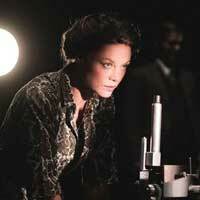 "...Cross masterfully played Rosalind Franklin to perfection and had the audience engrossed in her every word. Maurice Wilkins played by Nathan Hosner who has performed at Chicagoland theaters such as Chicago Shakespeare Theater, The Paramount Theatre and recently at Court Theatre in The Hard Problem as Jerry, is once again delighting theatergoers with his theatrical brilliance. His shy guy persona of Wilkins was on point with the fiery Franklin character played by Cross." "...Although it might seem like a simple history lesson, "Photograph 51″ is rich and human, diving deep beneath the surface to a place of uncertainty. Stalling's production is skillful, intentional, heartfelt, and not to be missed." "...Fiercely independent and intense, confident in her special ability to detect patterns, and unapologetic about her preference for working alone rather than as part of a group (a group that was, by default, an exclusive boys club), Franklin demanded to be treated as an equal rather than an “assistant.” And she bristled at what she perceived to be the sexist, condescending attitude of the stiff and painfully socially awkward Wilkins (an impeccable turn by Nathan Hosner) who persisted in addressing her as “Miss Franklin” rather than “Dr. Franklin.” Wilkins, lonely and awkward with women, was upended by her – at once undone by her bluntness, and, at the same time, attracted to her. Trouble." "...This show may not be everyone’s cup of tea. The subject matter is a little dense, but on the strength of a compelling central performance and the fact that it is relatively unknown story worth telling, I think Photograph 51 is more than worth your time." "...We have a wonderful theatrical spectacle, and the direction by Vanessa Stalling made the most of Photograph 51, “mining Ziegler’s text for all its thematic complexities,” as artistic director Charles Newell puts it. Watson & Crick’s discovery in 1953 of the double helix changed history, and our view of ourselves as humans. The knowledge of DNA’s role – and the potential for engineering new directions using it – is the basis for a world of change in arts and sciences." "...Though the story at the center of Photograph 51 is that of one woman’s obstacles to equality both professional and personal, it ultimately speaks to anyone who’s ever faced seemingly insurmountable resistance to their own advancement." "...It is a challenging story to tell because it requires the audience be brought up-to-speed on the science, research environment and significance of the work. All things that the average person may not be readily familiar with but which incidentally was apparently not lost on this University of Chicago, Hyde Park audience that seemed to revel in the sometimes petty nuances of the personal interactions." "...In the end, though, it seems to be a play that doesn’t fully trust itself. It needs to reach for the potential romantic entanglements with both Wilkins and Gaspar in order to humanize a character it simultaneously asks us to see as passionate only in her attention to her work. As in the story within the play of Wilkins and Franklin crossing paths but not meeting at a showing of A Winter’s Tale, we wonder what could have been if Ziegler had more faith in her subject matter." "...“Photograph 51” is an empowering statement about equality, perseverance and truth. While “the world wins,” the moving and heartfelt performance of Chaon Cross reveals Franklin as a complex, compassionate, driven chemist with an extraordinary thirst for knowledge. Most importantly, as art and science intersect, Rosalind Franklin’s rightful place as a trailblazer is assured." "...The entire cast shines, and especially for this writer, Hosner as Wilkins whose finale What If? question so movingly snatches the story out of scientific history into a compelling tale of the heart." "...In watching this play, the “what-ifs?” of Dr. Franklin’s story resonated deeply. What if instead of at being dismissed, infantilized or disrespected by her colleagues for being a woman, and worse a woman who did not fulfill their expectations, Dr. Franklin had been treated with the respect? As an equal? What if she had been given a reason to trust the scientists around her? This play is an accumulation of such critical moments in the life of Dr. Rosalind Franklin and a reflection on time and memory, fact and fiction. In the end the characters, as well as the audience, must face a solemn truth: the world turns with or without us and we have only the choices we make to comfort us."